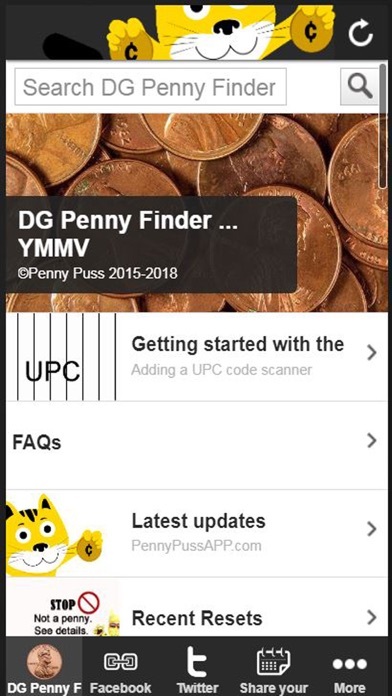 The Penny Puss with DG Penny Finder App is a database of past items that have been confirmed to ring as a penny in the DG stores. These items are never guaranteed. They may reset back to full price at any time. THERE MAY OR MAY NOT BE ANY NEW PENNY ITEMS IN THE FUTURE. We are not giving advice - only supplying you with the information that we have compiled. We do not have any ties to the DG stores. All pictures belong to us or we have been given permission to use them from other individuals. If an item does not ring up a penny, you CANNOT buy it for a penny. It means that it has either reset, or you have the wrong item. We do not condone glitches or any type of fraud. This is just a database of items that have been confirmed in the past. 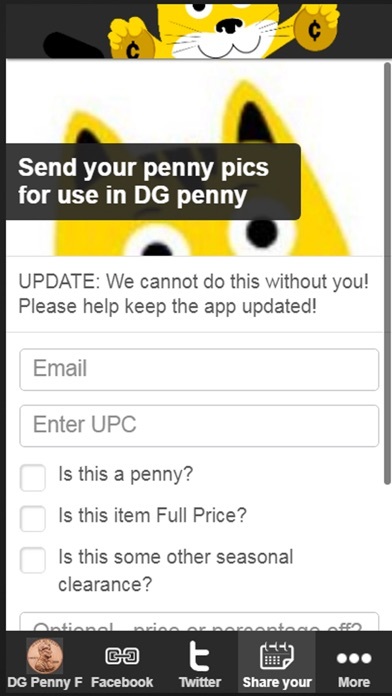 DG could stop penny items at any time. There is no guarantee. Some basics. Penny items may be hard to find and very specific. There may be very similar items that are full price. Items may reset to full price at any time. The DG penny finder is a shopping tool and not intended to be a replacement for your own diligent research. 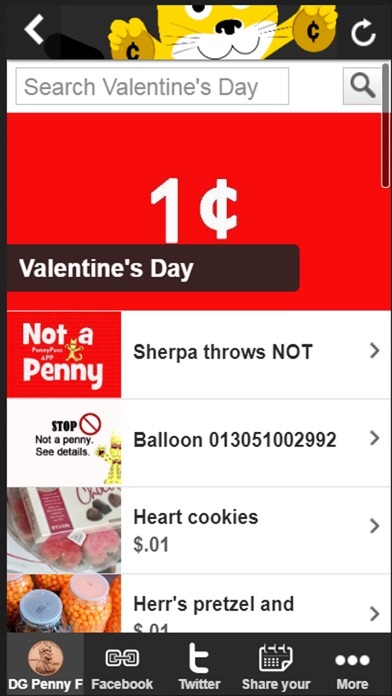 We also may or may not add current sales and clearance to the app as we see appropriate. You must have a wireless connection such as 3G to use this as an in-store tool. Some stores have bad reception. We are not responsible for that. Please note that this app does not have scanner capability at this time. This app is best when used in conjunction with our website. Rarely updated not worth the money do not download! !